TRIVIA of Noh : Q135 : Is it possible for Noh actors to change to different schools? | Home | Trivia | Q135 : Is it possible for Noh actors to change to different schools? Is it possible for Noh actors to change to different schools? There are five schools of Noh leading actors, with slight differences in dialogue and style when they perform the same piece. At one time, barriers between the schools were high. When some actors took on amateur pupils, they apparently even received signed notes of assurance that the pupils would never change to different schools. In the Edo era, though, some Noh actors did change to other schools, due to the wishes of domain lords such as the Maeda clan of the Kaga domain. The name of the “Kaga Hōshō” drama style suggests that the Hōshō School was very popular in the domain. In fact, however, the founder of the domain, Toshiie Maeda, liked the Konparu School. It was the fifth chief of the clan, Tsunanori Maeda, who apparently urged in-house actors to change to the Hōshō School, under the influence of the school's patron, the then shogun, Tsunayoshi Tokugawa. 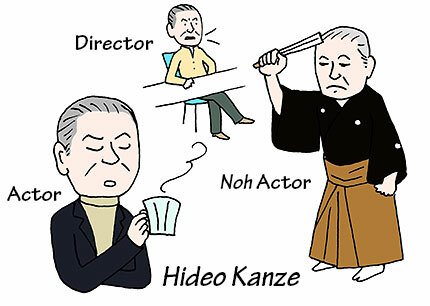 In recent years, Hideo Kanze is an example of an actor who changed to a different school for his own reasons. The son of Tetsunojō Kanze, Hideo said, “I was attracted by the Kita School’s method of building the body.” Although he had trained continuously since early childhood, Hideo changed school at the age of 22 (he later returned to the Kanze School). He also became active as a director and actor in many fields outside the world of Noh, developing a deep interest in modern drama and opera. Another case was Masanori Kusukawa, an actor of the Kongō School who studied under Ukyō Kongō but changed to the Kanze School shortly after World War II. Meanwhile, it is common for people born to families of Noh musicians or kyōgen actors to be become leading actors. For families of leading actors with no successors, it is traditional for a child to be adopted from another family in a different school, such as from the Kanze to the Hōshō, or vice-versa. Such cases may be seen as changes to different schools, but they are done solely to prevent the loss of a school. This is an expression of mutual cooperation among Noh actors.